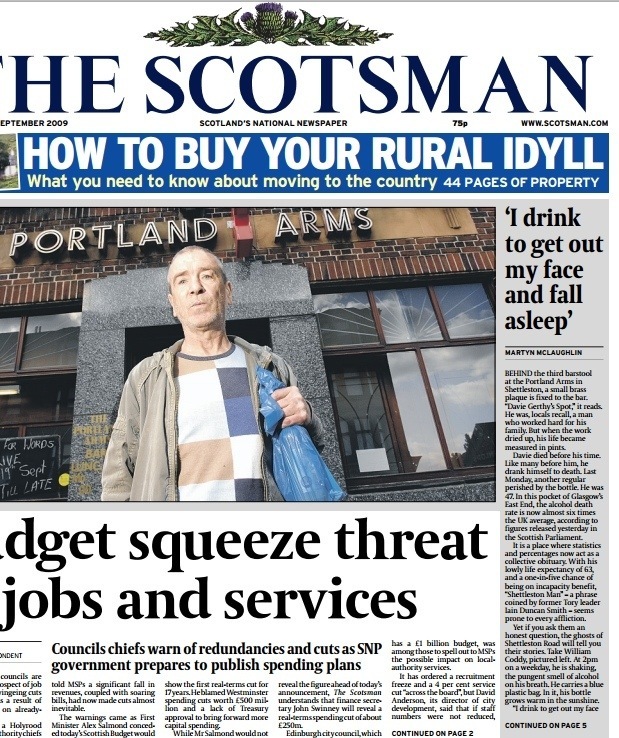 ‘Shettleston Man’ from The Scotsman. Looking beyond the statistics of Glasgow’s most notorious inhabitant. BEHIND the third barstool at the Portland Arms in Shettleston, a small brass plaque is fixed to the bar. “Davie Gerthy’s Spot,” it reads. He was, locals recall, a man who worked hard for his family. But when the work dried up, his life became measured in pints. Davie died before his time. Like many before him, he drank himself to death. Last Monday, another regular perished by the bottle. He was 47. In this pocket of Glasgow’s East End, the alcohol death rate is now almost six times the UK average, according to figures released yesterday in the Scottish Parliament. It is a place where statistics and percentages now act as a collective obituary. With his lowly life expectancy of 63, and a one-in-five chance of being on incapacity benefit, “Shettleston Man” – a phrase coined by former Tory leader Iain Duncan Smith – seems prone to every affliction. 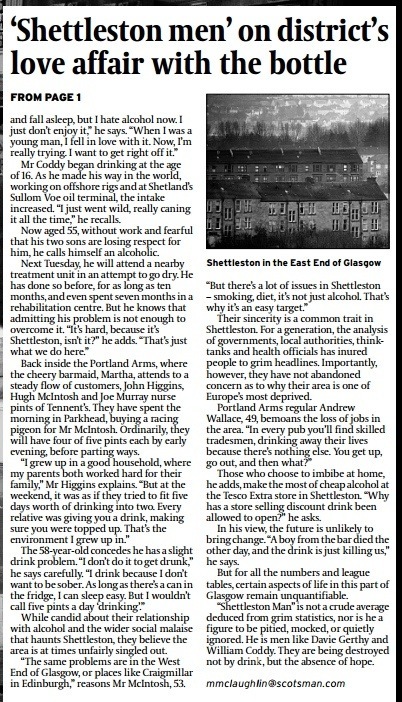 Mr Coddy began drinking at the age of 16. As he made his way in the world, working on offshore rigs and at Shetland’s Sullom Voe oil terminal, the intake increased. “I just went wild, really caning it all the time,” he recalls. Back inside the Portland Arms, where the cheery barmaid, Martha, attends to a steady flow of customers, John Higgins, Hugh McIntosh and Joe Murray nurse pints of Tennent’s. They have spent the morning in Parkhead, buying a racing pigeon for Mr McIntosh. Ordinarily, they will have four of five pints each by early evening, before parting ways. Their sincerity is a common trait in Shettleston. For a generation, the analysis of governments, local authorities, think-tanks and health officials has inured people to grim headlines. Importantly, however, they have not abandoned concern as to why their area is one of Europe’s most deprived. Those who choose to imbibe at home, he adds, make the most of cheap alcohol at the Tesco Extra store in Shettleston. “Why has a store selling discount drink been allowed to open?” he asks. In his view, the future is unlikely to bring change. “A boy from the bar died the other day, and the drink is just killing us,” he says. 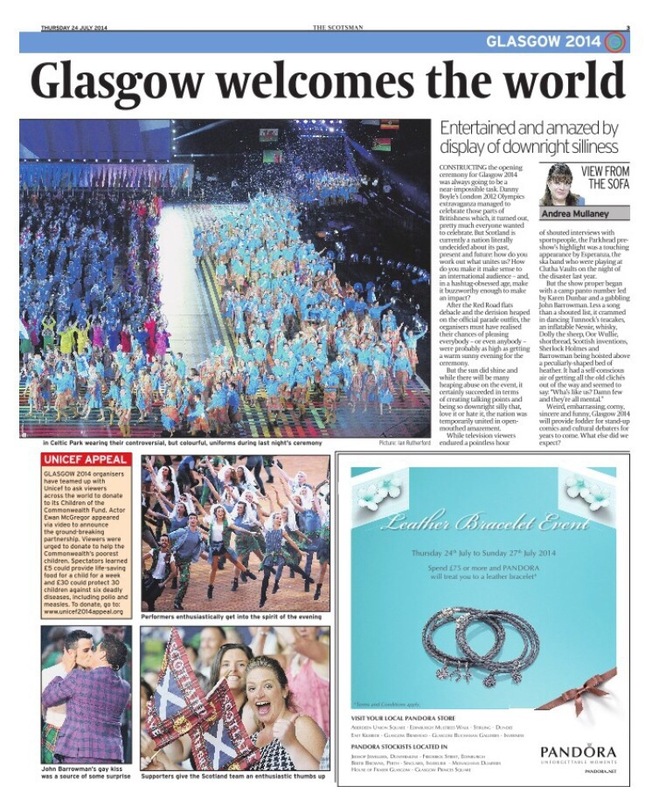 But for all the numbers and league tables, certain aspects of life in this part of Glasgow remain unquantifiable. “Shettleston Man” is not a crude average deduced from grim statistics, nor is he a figure to be pitied, mocked, or quietly ignored. He is men like Davie Gerthy and William Coddy. They are being destroyed not by drink, but the absence of hope. IF sheep could talk, or at least offer an encouraging bleat in the right direction, life on the southern foothills of the Campsie Fells would be immeasurably easier. Dense tangles of bracken and rabbit holes render every step treacherous, while the unforgiving slope cascading sharply towards the farmlands north of Kirkintilloch punish all but the surefooted. Chris, a former advertising man turned locksmith, has already tumbled three times and the sign is still one letter short. “The Y’s in four or five sections, so it’s not the easiest,” he shouts over, pulling and tugging at a long slither of white fabric. In the distance, a flock of six Scottish Blackface shoot their best impassive gaze. “It’s alright for them, eh?” puffs Chris, grabbing again at the material as it catches a clump of gorse. He is one of a group of strangers united by a desire to conquer geology and the very worst elements summoned by a Scottish summer to erect a vast sign, visible from villages, towns and roads from miles around stretching all the way to the northernmost hinterlands of Glasgow where the monolithic superstructures of the remaining Red Road Flats jut out from the horizon like Lego bricks discarded by a giant toddler. Some 65 metres long by 30 metres high, the sign has three letters and spells out one word, its message as pure and elementary as the air on the Campsies itself: ‘YES’. 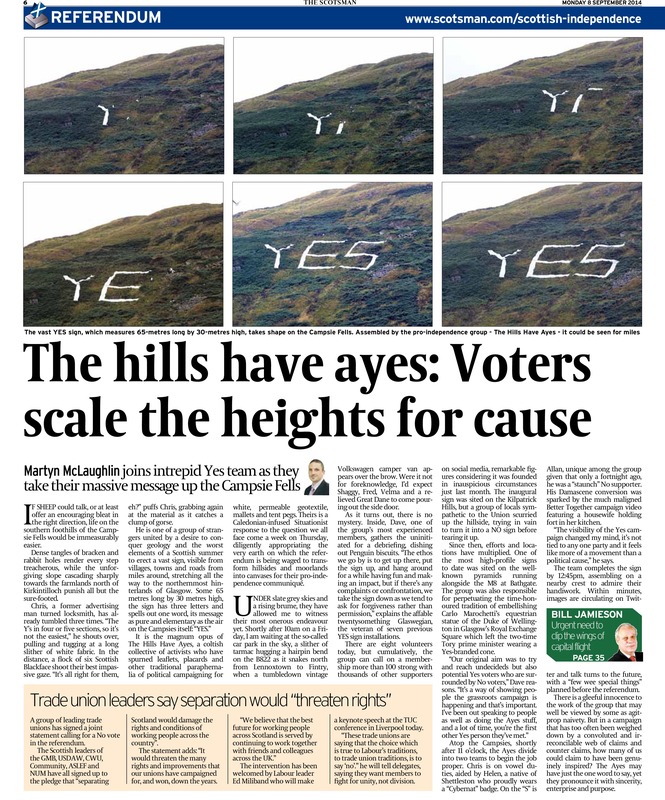 It is the magnum opus of The Hills Have Ayes, a coltish collective of activists who have spurned leaflets, placards and other traditional paraphernalia of political campaigning in favour of altogether grander intentions. Armed with swaths of white, permeable geotextile, mallets, tent pegs and boundless enthusiasm, they have conceived a Caledonian-infused Situationist response to the question we all face come a week on Thursday, diligently appropriating the very earth on which the referendum is being waged to transform hillsides and moorlands into sweeping canvases for their pro-independence communiqué. Under slate grey skies and a rising brume that forms a wall of smirr as it hits the volcanic range, they have allowed me to witness their most onerous endeavour yet. Shortly after 10am on a Friday morning, I am waiting at the so-called car park in the sky, a slither of tarmac hugging a hairpin bend on the B822 as it snakes north from Lennoxtown to Fintry, when I hear the putter of an approaching engine. Moments later, a tumbledown vintage Volkswagen camper van appears over the brow and parks up alongside me. Were it not for foreknowledge, I’d expect Shaggy, Fred, Velma and a relieved Great Dane to come pouring out the side door. As it turns out, there is no mystery. The Ayes want only to sway those voters in East Dunbartonshire who are as yet undecided and perhaps have a little merriment along the way. Inside the van, which houses a working oven, an old CB radio and a handbrake that groans uneasily on the slightest of gradients, one of the group’s most experienced members gathers the uninitiated for a quick briefing, dishing out bottles of water, packets of crisps and Penguin biscuits by the way of fuel. “The ethos we go by is to get up there, put the sign up, and hang around for a while having fun and making an impact, but if there’s any complaints or confrontation, we take the sign down as we tend to ask for forgiveness rather than permission,” explains Dave, an affable twentysomething Glaswegian, the veteran of seven previous YES sign installations. “But the fog’s pretty bad out there and I don’t want to pressure anyone into anything they’re not comfortable with,” he adds. “There’s no point people getting cold, miserable and slipping around if no one can see it.” No one in the van raises an objection, not even Stuart, a thoughtful young filmmaker valiantly attired in cut off shorts and trainers. The Ayes, it seems, have it. There are eight volunteers gathered at the Crow Road car park today, but cumulatively, the group can call on a membership more than one hundred strong with thousands of other supporters on social media, remarkable figures considering it was founded in inauspicious circumstances just last month. The inaugural sign – measuring just 24 metres by 12 metres – was sited on the Kilpatrick Hills, but when its creator left to take photographs from the vantage point of the Erskine Bridge, a group of locals sympathetic to the continuation of the Union scurried up the hillside, trying in vain to turn it into a NO sign before tearing it up. Since then, the efforts and locations have multiplied. 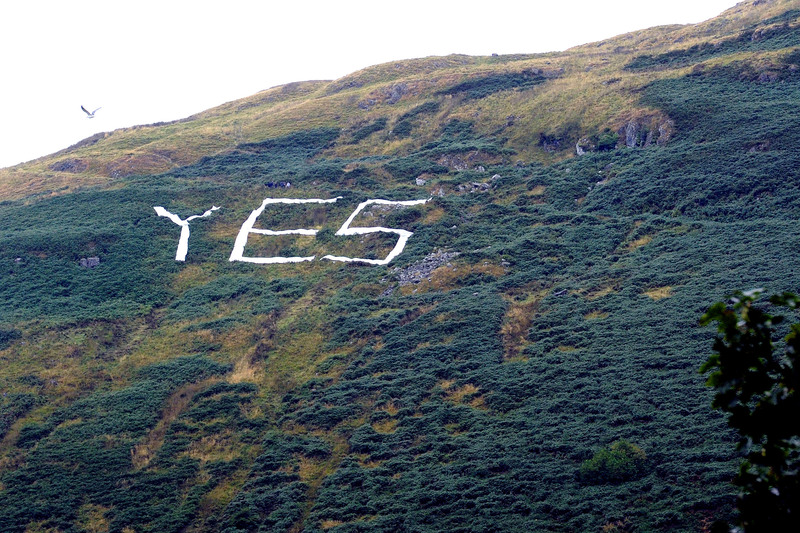 In the Pentland Hills, a YES was erected at Hillend to the boastful claim that it measured twice the height of the famous Hollywood sign in the Santa Monica mountains. Above the village of Renton at Carman Hill, home to the ruins of a fort some believe once provided refuge to Robert the Bruce, the same three letters were spawled out and pegged in to the terra firma, a sight repeated in Durness, Johnstone, Kilbarchan, Neilston and the Ochils. One of the most high profile emblems to date was sited on the well-known pyramids running alongside the M8 at Bathgate where, Dave recalls, the response was overwhelming: “We thought the traffic might slow down a little but we didn’t expect people to come to a stop and get out of their cars to take photographs.” As well as the YES signs, the group was also responsible for perpetuating the time-honoured Glaswegian tradition of embellishing Carlo Marochetti’s equestrian statue of the Duke of Wellington in Royal Exchange Square. Used to ordinary traffic cones, the two-time Tory prime minister found himself wearing a Yes cone, brandishing a flag to boot. As time has gone on, other innovative approaches have taken root. In Largs, the Ayes enlisted the help of an electrical engineer to ensure not even nightfall could veil their message, thanks to a neon blue illuminated sign on a prominent hummock overlooking the North Ayrshire town. A few miles south, in the cold of the Firth of Clyde, one enterprising adherent swam out to affix the word to a rocky outcrop off Arran’s east coast. As word spreads and local Yes groups take it upon themselves to erect their own letters, the hills of Scotland are becoming increasingly alive with the sound of etymology. Laying the foundations for this discourse requires considerable graft. The sign at the Campsies, previously used in the Ochils, consists of around a dozen separate strips of Terram geosynthetic, each given a spray painted identifier – Y1 or E3, for example – and bound by blue polypropylene rope. A bulwark ordinarily used in construction and civil engineering projects, the Ayes procured their haul from a solicitous shop assistant in a branch of builders’ merchants, Jewsons. “The guy wouldn’t tell us which we he was voting but he gave us a good discount,” grins Dave through a bushy beard. On the Campsies, an area has been chosen and mapped out several hundred feet above ground level. After humphing the textiles and tools up the terrain, the Ayes take a short breather, looking out through the clearing fog to Kirkintilloch, Lenzie, Bishopbriggs and beyond. It is an arresting vista and one which provides relief and invigoration in equal measure to the drookit party. Shortly after 11.20am, fortified by more biscuits, they dividing into two teams to begin the job proper. Chris, by virtue of working on the ‘E’ on his last deployment, is on vowel duties, aided by Helen, a native of Shettleston who proudly wears a ‘Cybernat’ badge and has taken Mac, her sheepdog, along for the ride. “I like your nail polish,” Chris tells her. “Aye, well it’s not going to last long up here,” she replies. Among the Ayes in attendance today is Allan, manfully working on the lower arc of the ‘S’. Unique among the group given that only a fortnight ago, he described himself as a “staunch” No supporter, his Damascene conversion was sparked by that much maligned Better Together campaign video featuring a housewife holding fort in her kitchen. Where he had hope for politics of empowerment, the film spread a message warning that politics was “scary and confusing.” Fortuitously, the Ayes chose the following day for their Duke of Wellington installation, encouraging Allan to switch allegiances. “It was just one gesture but it showed that the Yes camp was more in touch with the electorate and was having more fun than the doom and gloom of No,” he says. “The visibility of the campaign changed my mind, it’s not tied to any one party and it feels like more of a movement than a political cause.” The realisation that his political ideology was misplaced was, adds Allan chastening but ultimately rewarding. “When nothing is for certain I think the possibility of better is better than the fear of worse,” he reflects. With the ‘E’ and ‘S’ in place, the two teams reconvene to pool their efforts into the ‘Y’. It is the trickiest letter of the three, courtesy of some miscalculations that left its upper right branch three metres short. Some careful positioning, however, masks the shortfall and by 12.45pm, after nearly an hour and a half’s toil, the sign is complete. “YES!” the group cheer, standing on a crest admiring their handwork as a south-bound Easyjet flight passes over above, en route to Glasgow Airport. Later, a returning holidaymaker will post on their Facebook page revealing how she saw the sign from the skies. Just a quarter of an hour later, news reaches of them of the first tweet, an image taken by a Lennoxtown resident that is spreading across social media. After what Dave describes as “by far the toughest” sign they’ve put up so far, the sense of accomplishment is keenly felt. In line with their environmentally conscious approach, the Ayes leave the landscape as they found it, and after an hour or so of taking photographs, they disassemble the sign before heading back down the hill to the van. The Ayes, environmentally conscious, try to leave the landscape as they found it, and for the most part stay with a sign for a few hours before rolling it up and heading back to the VW camper van for a change of clothing and a trip to their ‘Yes factory’ in Glasgow’s west end to plan for their next expedition. Jewsons, it seems, can expect a windfall; with less than two weeks to go, their plans are ambitious and Dave hints at a “few wee special things” in store over the coming days. There is a gleeful innocence to the work of the group that may well be viewed as agitprop naivety by some. But in a campaign that has too often been weighed down by a convoluted and irreconcilable web of claims and counter claims over issues such as currency and EU membership, how many of us could claim to have been genuinely inspired by the debate so far? The Ayes may have just the one word to say, yet they pronounce it with sincerity, enterprise and purpose. 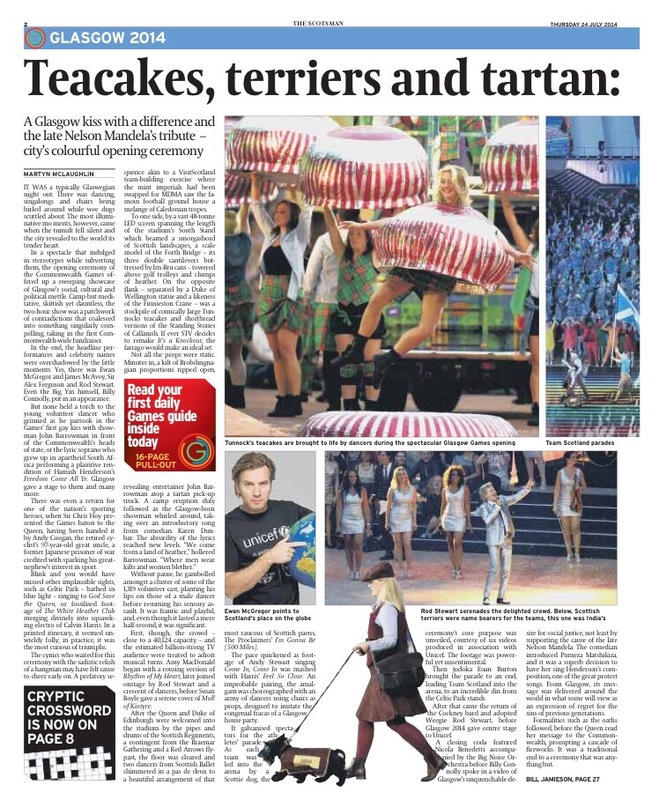 IF the army of Commonwealth Games volunteers has a benevolent frontline, it is deployed at Central Station, a place notorious in Glasgow’s psychogeography for the grousing that meets late trains, with worse awaiting those that don’t depart at all. Cutting through its opprobrium takes inexhaustible altruism, a quality Larry Richardson has in abundance. Larry is one of 15,000 Clydesiders, the tireless shepherds of Glasgow 2014 who tend to their flock with an almost evangelical zeal. Clad in red polo shirts and grey trousers, they direct and explain, greet and console, guide and inspire. Above all, they smile, offering a universal welcome to those saddled with suitcases and fatigue. The image of the Games beamed throughout the world has been of elite athletes and world class venues, where records have been broken and remarkable narratives told. Although the Clydesiders have caught the odd event, most have witnessed little of the sporting glory. They exist in the spaces in-between: the dimly lit concourses of bus and subway stations; windowless offices in the SECC; the boondocks around Anderston, Carmunnock and Tollcross. None of these places have seen medal ceremonies, but they have been graced by a kindness purer than 24 carat gold. At Central Station, the vanguard is based beneath the terminal’s famous suspended Victorian clock, a fitting locale given the way the timepiece has served as a meeting point for incomers and locals alike for over a century. With a central desk festooned with maps, timetables and pamphlets, around 14 Clydesiders flit among the throng of commuters, working in eight and a half hour shifts. 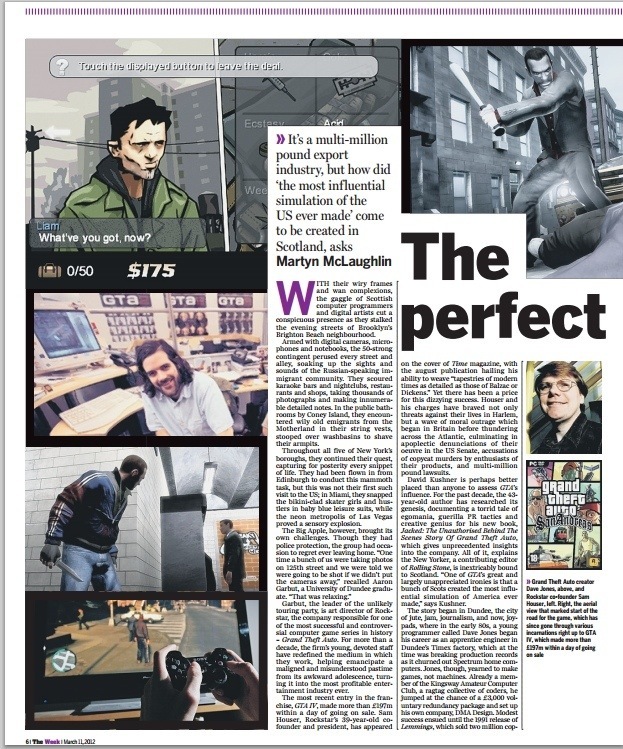 ‘The Perfect Crime’ from Scotland on Sunday. 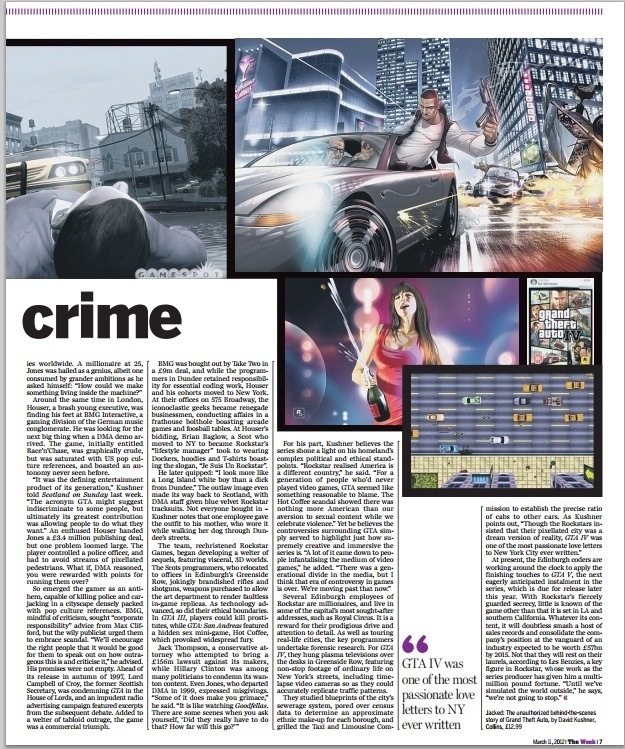 The phenomenon of Grand Theft Auto. 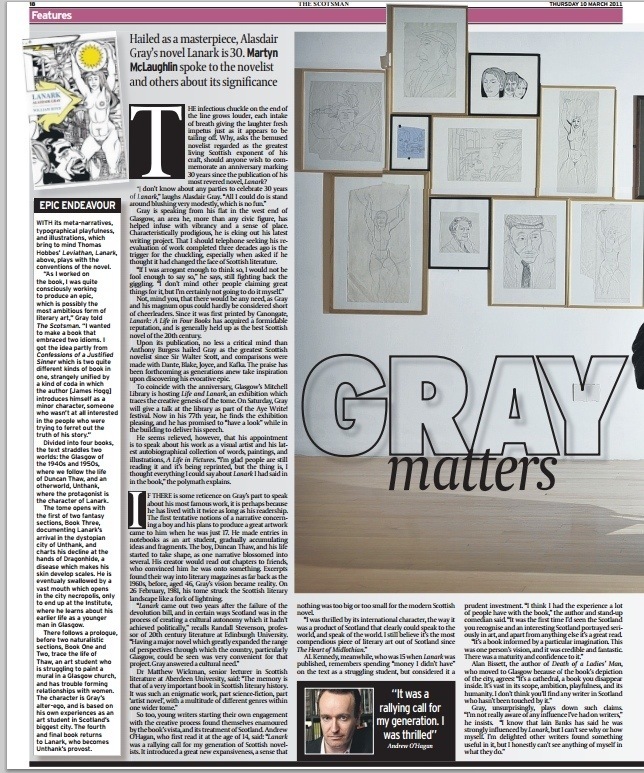 ‘Gray Matters’ from The Scotsman. 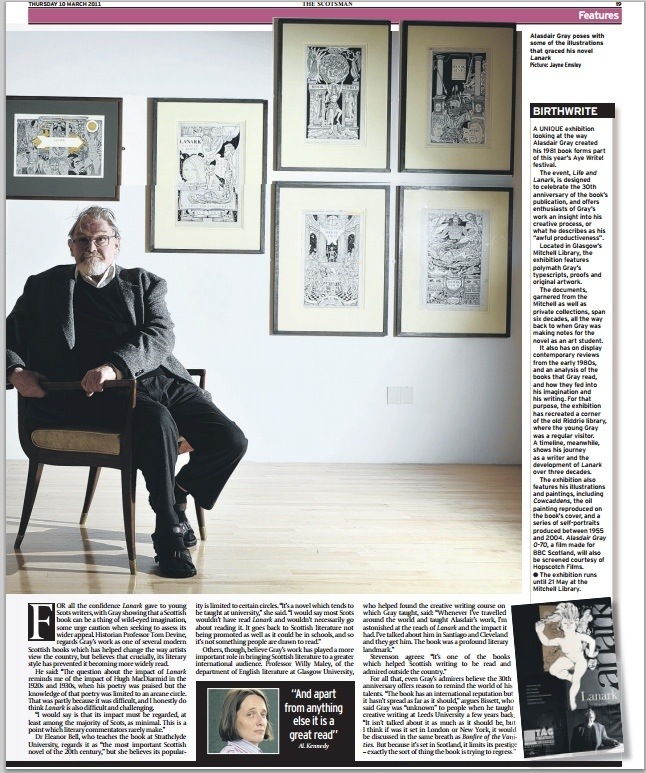 Interviews with Alasdair Gray and other leading writers on 30 years since Lanark. Not, mind you, that there would be any need, as Gray and his magnum opus could hardly be considered short of cheerleaders. Since it was first printed by Canongate, Lanark: A Life in Four Books has acquired a formidable reputation, and is generally held up as the best Scottish novel of the 20th century. Upon its publication, no less a critical mind than Anthony Burgess hailed Gray as the greatest Scottish novelist since Sir Walter Scott, and comparisons were made with Dante, Blake, Joyce, and Kafka. The praise has been forthcoming as generations anew take inspiration upon discovering his evocative epic. To coincide with the anniversary, Glasgow’s Mitchell Library is hosting Life and Lanark, an exhibition which traces the creative genesis of the tome. On Saturday, Gray will give a talk at the library as part of the Aye Write! festival. Now in his 77th year, he finds the exhibition pleasing, and he has promised to “have a look” while in the building to deliver his speech. He seems relieved, however, that his appointment is to speak about his work as a visual artist and his latest autobiographical collection of words, paintings, and illustrations, A Life in Pictures. “I’m glad people are still reading it and it’s being reprinted, but the thing is, I thought everything I could say about Lanark I had said in in the book,” the polymath explains. If there is some reticence on Gray’s part to speak about his most famous work, it is perhaps because he has lived with it twice as long as his readership. The first tentative notions of a narrative concerning a boy and his plans to produce a great artwork came to him when he was just 17. He made entries in notebooks as an art student, gradually accumulating ideas and fragments. The boy, Duncan Thaw, and his life started to take shape, as one narrative blossomed into several. His creator would read out chapters to friends, who convinced him he was onto something. Excerpts found their way into literary magazines as far back as the 1960s, before, aged 46, Gray’s vision became reality. On 26 February, 1981, his tome struck the Scottish literary landscape like a fork of lightning. For all the confidence Lanark gave to young Scots writers, with Gray showing that a Scottish book can be a thing of wild-eyed imagination, some urge caution when seeking to assess its wider appeal. Historian Professor Tom Devine, regards Gray’s work as one of several modern Scottish books which has helped change the way artists view the country, but believes that crucially, its literary style has prevented it becoming more widely read. 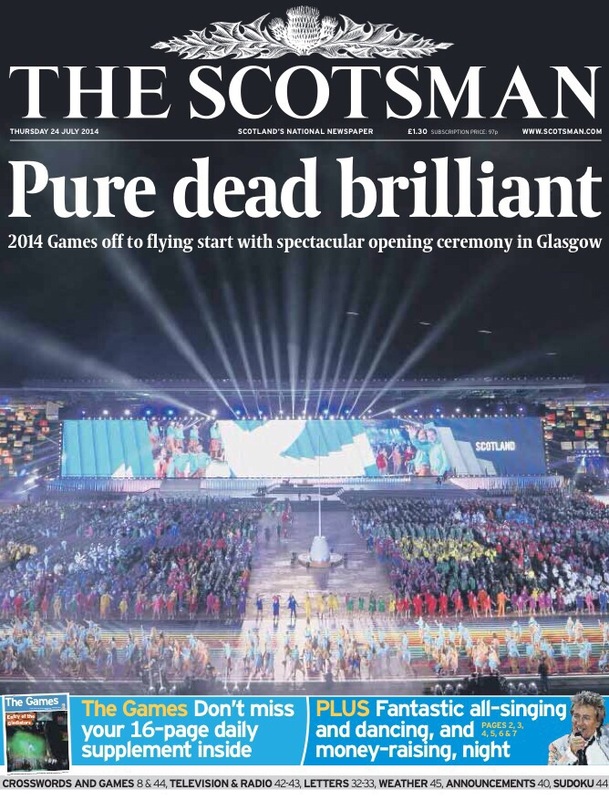 ‘Dart and Soul’ from Scotsman. The heady world of the Professional Darts Corporaton, as seen from Aberdeen. AN XXL-sized Hawaiian shirt and matching Bermuda shorts, boasting colours seldom seen outside of Reactor One at Torness, are not the easiest garments to procure in the humble shopping thoroughfares of Aberdeen, especially when spring has only begun to rear her head. Deek will not be the only one. Tonight only, it is excess all areas in the Aberdeen Exhibition and Conference Centre (AECC), as the Whyte & Mackay Premier League Darts contest rolls into town. At one sprawling table, seating two dozen revellers – each with at least two pints of lager – Fred Flintstone, a ginger Mexican, a band of Forres vikings, and a gaggle of bearded monks let rip the bawdiest of roars. “Come on, Phil, f*****g kill him!” bellows Fred. One of the Vikings clambers atop his seat, whooping and cheering. The monks, meanwhile, break their vow of silence with great aplomb, screaming the unprintable. To their left, a short, middle-aged man in a blue shirt marches stoically down a red carpet. He is surrounded by four burly security guards, and a three-strong camera crew. High above, a giant projection television magnifies his squat, podgy features. Forks of CGI-rendered lightning crash down around his image, while crunching guitar chords blare from the speakers. Phil ‘The Power’ Taylor may look like the sort of man who ekes out a living furtively selling snakes and terrapins in the backrooms of downtrodden public houses with wallpaper the colour of the inside of a teapot. His entrance, however, need leave no-one in doubt – this 48-year-old former sheet-metal worker is a multimillionaire sports star. Yes, the S word, once as readily associable with the oche as customer service was with British Airways. 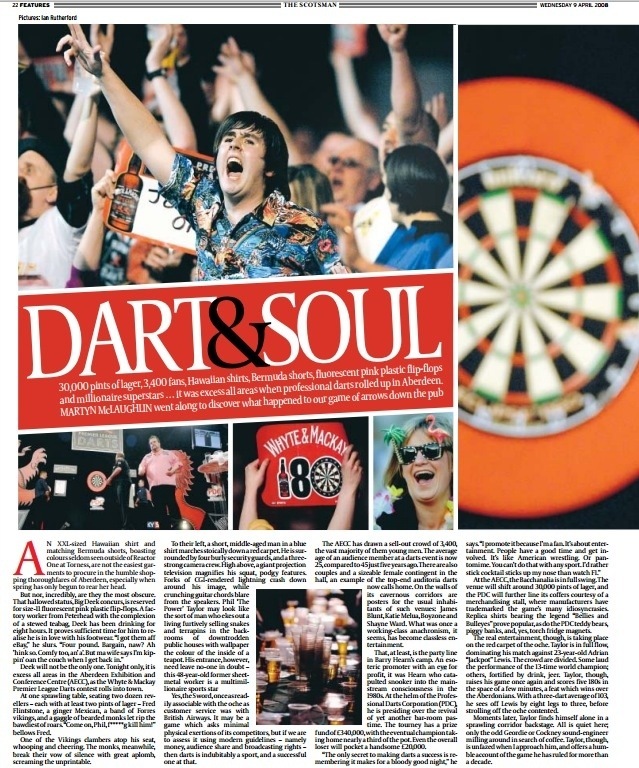 It may be a game which asks minimal physical exertions of its competitors, but if we are to assess it using modern guidelines – namely money, audience share and broadcasting rights – then darts is indubitably a sport, and a successful one at that. The AECC has drawn a sell-out crowd of 3,400, the vast majority of them young men. The average age of an audience member at a darts event is now 25, compared to 45 just five years ago. There are also couples and a sizeable female contingent in the hall, an example of the top-end auditoria darts now calls home. On the walls of its cavernous corridors are posters for the usual inhabitants of such venues: James Blunt, Katie Melua, Boyzone and Shayne Ward. What was once a working-class anachronism, it seems, has become classless entertainment. That, at least, is the party line in Barry Hearn’s camp. An esoteric promoter with an eye for profit, it was Hearn who catapulted snooker into the mainstream consciousness in the 1980s. At the helm of the Professional Darts Corporation (PDC), he is presiding over the revival of yet another bar-room pastime. The tourney has a prize fund of £340,000, with the eventual champion taking home nearly a third of the pot. Even the overall loser will pocket a handsome £20,000. At the AECC, the Bacchanalia is in full swing. The venue will shift around 30,000 pints of lager, and the PDC will further line its coffers courtesy of a merchandising stall, where manufacturers have trademarked the game’s many idiosyncrasies. Replica shirts bearing the legend “Bellies and Bulleyes” prove popular, as do the PDC teddy bears, piggy banks, and, yes, torch fridge magnets. The real entertainment, though, is taking place on the red carpet of the oche. Taylor is in full flow, dominating his match against 23-year-old Adrian “Jackpot” Lewis. The crowd are divided. Some laud the performance of the 13-time world champion; others, fortified by drink, jeer. Taylor, though, raises his game once again and scores five 180s in the space of a few minutes, a feat which wins over the Aberdonians. With a three-dart average of 103, he sees off Lewis by eight legs to three, before strolling off the oche contented. Moments later, Taylor finds himself alone in a sprawling corridor backstage. All is quiet here; only the odd Geordie or Cockney sound-engineer milling around in search of coffee. Taylor, though, is unfazed when I approach him, and offers a humble account of the game he has ruled for more than a decade. As the action begins again, Peter Manley takes to the red carpet. He revels in an equally bombastic entrance, even if the camera crew are forced to work a little harder to keep him in frame. Manley’s nickname is “One Dart,” but, in truth, “Five Courses” would be more apposite. His frame smothered by a pink shirt, he treats the crowd to a surefooted dance to the tune of (Is This The Way To) Amarillo. Quite how all this transfers to television, God alone knows. It is the job of Dave Clark and his two-dozen odd crew – which includes Eric Bristow, one of the game’s 1980s stars, who performs mathematical calculations to work out where the next dart will be thrown – to ensure this frenzy makes for good viewing. “It’s a cross between a German beer festival and a gladiatorial arena,” he jests. Not a trick is missed in the television coverage. Adrian, Sky’s sound engineer, explains that five mics along hang by the dartboard itself. When a flight lands, the noise is compressed so as to suggest the sound of a crossbow. There are 25 further microphones hung around the AECC to pick up every holler, even if half must be subsequently censored. It is a challenge, Adrian adds, comparable with “juggling custard”. The night rolls on, and games come and go. No-one can quite rival Taylor, who reclaims his position at the top of the league. By 10:30pm, the last flight has been thrown, and the crowd, sufficiently sated, roll into coaches, buses, and taxis, Hawaiian shirts fluttering in the cold wind. The PDC crew and the Sky workers begin to dismantle the stage. By 3am, they will be gone, already working out the plans for their next leg in Liverpool. The darts fraternity are too busy, too happy, to care about the debate over whether their game is a sport or not. Healthy profits are being made, record crowds are leaving satisfied and the players seem humbled at their new status. Whatever characteristics make sport great, many could learn a thing or two from those who walk the oche. 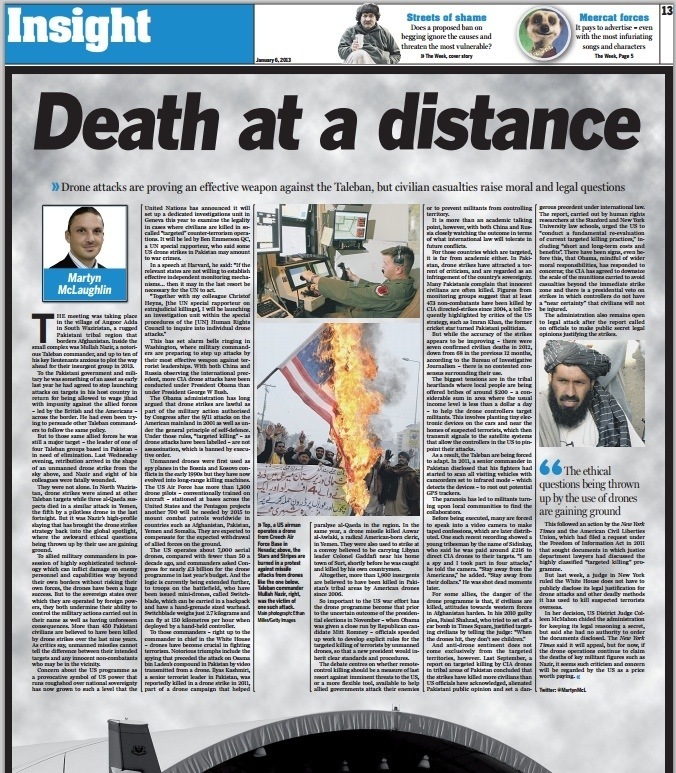 ‘What Lies Beneath’ from The Scotsman. The secret social history of Glasgow’s notorious Red Road flats. THEY are vast, steel-framed structures reaching up to the heavens, cities in the sky which afforded thousands an existence above terra firma. For better or worse, the Red Road flats have become an iconic feature of the skyline in Scotland’s biggest city, their looming presence a titanic symbol of a social experiment designed to cure Glasgow’s poor, yet which came to ail them. But far down, deep below the dizzying summits of their towering blocks, there exists another life to the Red Road, a subterranean bolthole where, over a dram or a game of bingo, those from the 30th floor could mix with those from the third. Now a new exhibition is to revive the underworld of the colossal edifices that have lain unseen for a generation, documenting a lost era when an architect’s dream had yet to turn into a nightmare. Red Road Underground, which opened yesterday, aims to chart the social history of the blocks, featuring stunning photographs and memories of those who lived there. It comprises images, drawings, and videos, and the focus of the exhibition is a little-known space once home to a bingo hall and bar, where residents could reaquaint themselves both with one another and solid ground. the exhibition is part of the Red Road Cultural Project – a partnership between Glasgow Housing Association and Glasgow Life to recognise the legacy of the flats – and the timing of the project has particular resonance. Soon the hulking towers will be levelled, as the city’s authorities gradually bury all signs of the high-rise accommodation projects so in vogue during the 1960s. When completed in 1969, the towers, located between Balornock and Barmulloch in the north-east of Glasgow, were heralded by the city fathers as a fresh start for the people of Springburn and further afield, removing them from blackened, overcrowded Victorian tenements to a fresh new civic space, complete with shops, play areas, lock-ups and landscaping. 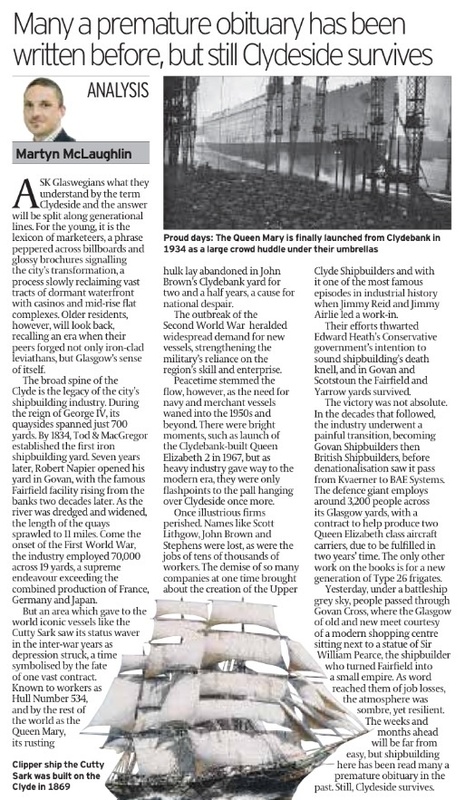 It is an era perfectly captured in the month-long exhibition, which is being held at the New Glasgow Society. In the making for two years, it is not simply a look at the imposing architecture of the Red Road flats, but the memories of those who called them home. Photographer Chris Leslie and illustrator Mitch Miller were among the first people in nearly two decades to visit the underground space, found under the car park at 10-30 Petershill Court. Its star attraction is the Mecca Bingo and Social Club, a dilapidated yet poignant symbol of Glasgow’s past. With seating for around 1,000 people, the auditorium held prize bingo, part of national games, and boasted a function suite for weddings, christenings, and other social occasions. Buses brought players there from all over the city, and they descended beneath ground, took their fill from the buffet, and settled down for a game in the hope of victory (winners would receive a special Red Road cheque, which could be cashed at the Bank of Mecca). Next door stood The Brig, a nautically themed bolthole where punters could enjoy a drink and, appetite permitting, a roll and sausage. Indeed, it is in the little details that the exhibition truly comes to life, despite the ravages of time. Both the bingo hall and bar were decimated and forced to close in the mid 1990s when a fire in a supermarket above brought a deluge of hosewater down below. A generation later, the decay is evident, with pools of water dominating the floorspace, and the ceiling has collapsed in several places. Yet, as Mr Miller points out, it is a place of “beautiful desolation”. In The Brig, meanwhile, the team discovered keys and glasses left on the tables, as if the drinkers had just popped outside for a moment, as well as paintings still hanging on the walls. Miller also drew on the anecdotes of those who frequented the hall to design what he calls a Bingo Dialectogram. A charming sketch of the space based on residents’ memories, it also features their recollections of enjoying an evening out. One Red Road regular, Helen McDermott, recalls how the bingo hall was “grand” compared to others in the city, and says: “You could win prizes, or you could win money – you could save the vouchers up. I’d go every afternoon, sometimes nights. I liked quiet nights, there was a better chance of winning. With the end for the high-rises now in sight, those charged with yet another renewal of Glasgow’s housing stock believe the exhibition – also featuring author Alison Irvine giving a reading from her novel, This Road Is Red – will allow the much-maligned flats to be celebrated. “We’re delighted to be playing our part in celebrating the rich history of the Red Road flats over more than four decades,” says David Fletcher, Glasgow Housing Association’s assistant director of regeneration. “This exhibition is part of the Red Road Cultural Project, which is providing a lasting legacy of the flats for future generations.” Soon, the long shadows cast by the Red Road will be lifted. Once they are gone, Glasgow’s skyline will never be the same, but the memories of the high life, at least, will remain. ‘Goodwill Shunting’ from The Herald. The tireless work of the volunteers at the Keith and Dufftown railway. THERE once was a train driver whose visits in the early 1930s to the Banffshire town of Keith heralded such regular delirium that the story of his exploits has lost none of its colour, even now. Timekeeping was one of this man’s few virtues and the 8.05am Inverness express under his charge was seldom behind schedule. The driver would direct an uneasy nod and a wave as his green 4-4-0 locomotive whistled past the crowded platform, hurtling on for a few hundred yards before trundling to a halt by a secluded thicket. Stone drunk, he would park himself on the cabin seat and shut his eyes for a brief, blissful moment, bathing in the noxious aroma from the nearby Strathmill distillery. The regular commuters knew the driver was content waiting in his fug of malt and yeast. Easing down from the platform, they would traipse along the trackside gravel to board the carriages. The more heated complaints would come from visitors, yet the protestations made no difference. The only thing ever to terminate at the station was the passengers’ patience. It was a queer custom, but one which, like many traditions of the railway, has refused to die. Take Peter Wood, a retired schoolteacher from Somerset, and his cocker spaniel, Dora. Their every weekend is spent at the immaculate station of Keith, amid its wheelbarrows and mops, updating ledger books and polishing plaques. “It stops me vegetating, ” says Wood. Timetables from 1956 for the London and North Eastern and Midland railways adorn the waiting-room walls, while signs promote the wares of WF Hartridge – Meat Salesman. With Laurie, a council maintenance worker, and Michael, a retired Methodist minister who helps clean up, they form part of a three dozen-strong volunteer pool at Keith and Dufftown Railway Association. The organisation emerged 14 years ago in response to British Rail’s declared intention to lift the track between Keith and Dufftown. It did not seem an unreasonable proposition – passengers had last travelled along the 11-mile stretch 30 years before, while freights of cattle, grain, manure and agricultural lime had also departed. While modest in number, the association possessed mountainous resolve. The line had been a part of the community for nearly 150 years, ever since the rise of the Great North of Scotland Railway in the mid-1800s. Convincing British Rail of the merits of preservation, the volunteers set about restoring track and strengthening bridges. Much of the work was manual, and engineers and maintenance workers, especially younger men, were – and continue to be – in short supply. Nevertheless, word spread through heritage railway enthusiasts – there are 350 miles of such track throughout Great Britain – and diesel locomotives, shunters and railbuses were donated from museums and distilleries northwards. Six years ago the graft paid off as a two-coach class 108 diesel transported scores of locals who had last used the line in the 1960s. There was not a dry eye around. Work has since progressed, with the railway now a fully functioning, if largely anonymous tourist draw. Many combine a trip with visits to the nearby Glenfiddich distillery, while families lunch at Dufftown station in picturesque 1930s Brighton Belle Pullman carriages. Home to a portfolio of now-withdrawn locomotives such as the Spirit of Speyside and the Wee Mac, the route does attract individuals of a certain disposition. Beards and anoraks are common. One recent visitor from Birmingham, a volunteer confides, went as far as to call his nephew every day of his visit to ensure his model railway was still working. The association even runs “driver experience days”, during which enthusiasts learn how to drive mainline diesel locomotives. Certainly, some of the association’s helpers share such long-derided passions. Keith, a town planner in his early thirties from Erskine, travels to Banffshire once a month. Somewhat coy, he will only admit he has “always been pretty interested in trains”. Others simply relish the association’s strong community identity. By 12.14pm, it is time to board the Spirit of Speyside to Dufftown. Its twin green carriages amble by tufts of gorse and the streams running down from Loch Park. Lambs and hares dart through the farmland, while the occasional sheep crosses the line. It is a beautiful trip. More than 20 passengers are spellbound by the gentle, affectionate pedantry of it all; the guard, for instance, punches our tickets despite knowing everyone has paid. Frustrations common with mainline train services receive no voice here. This is not a commute, but an experience, albeit one proving increasing hard to sustain. In time, it is hoped an extended track can welcome the Royal Scotsman, but knowledge of the diesel stock, replacement parts and membership numbers succumb yearly to the rigours of time. Those involved with the association believe it is a social enterprise, keeping alive the heritage of this swath of the north-east. In another 70 years, they hope, the stories of the railway will live on, stronger than ever.